An Attack with Sarin Nerve Gas on the Tokyo Subway System and Its Effects on Victims. On the morning of March 20, 1995, the Tokyo subway system was attacked with nerve gas. According to an announcement from the Tokyo Metropolitan Fire Department, twelve people were killed and 5498 were injured . Checking the　hospital patients suffering from the attack, we found that shrinkage of the pupil was a　common symptom, and that plasma cholinesterase levels of many patients were under　the normal range. These symptoms indicated that some kind of organophosphorus　substance must be the culprit, and it strongly suggested the use of nerve gas. This incident reminded us of the Matsumoto 's case, which was thought of as sarin attack　executed by a religious cult Aum Shinrikyo in June 27, 1994. The liquid left in the plastic bags on the subway cars was analyzed, and sarin was　detected as a major component. There are a few reported incidents of accidental　exposure to sarin and a single report on experimental exposure , but there had　been no study of mass exposure to sarin until the attack occurred at Matsumoto . Reports of severe cases, relation between pupil size and acetylcholinesterase(AChE) level , and a survey of subjective symptoms in patients affected by the Tokyo attack have already been reported to journals, but there has not　yet been a formal evaluation of the relation between the occurrence of symptoms and dose of exposure to sarin. In　this　study, health effect of victims at acute phase was　studied and its relation to the exposure dose was analyzed. Attackers left plastic bags filled with liquid in the subway cars. Volume of liquid in　each bag was about 600 ml and was separated into two layers. The top layer was a　transparent liquid of about 200 ml, and the bottom layer was a dark brown liquid　measuring about 400 ml. A group of Metropolitan Police lead by one of our authors　analyzed these materials using GC/MS analysis, NMR, and other methods. The total ion chromatogram of the material left in the subway　cars was obtained using temperature programmed methods and capillary column　chromatography (Figure 1). 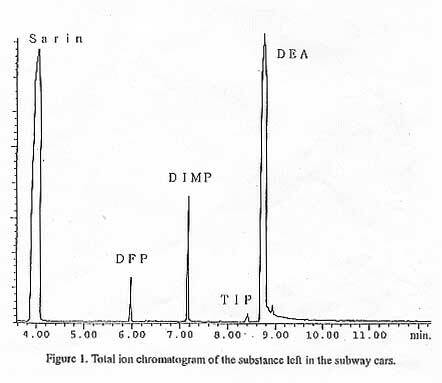 Figure 1, Total ion chromatogram of the substance left in the subway cars. From retention time analysis and mass spectrum data of　standard material of each substance　we identified diisopropyl-fluoro-phosphonate　(DFP) at a retention time of 6 minutes, diisopropyl-methyl-phosphonate (DIMP) at a　retention time of 7.2 minutes, a small peak of triisopropyl-methyl-phosphonate (TIP)　at a retention time of 8.2 minutes, and a huge peak of N,N-diethylaniline (DEA) at a　retention time of 8.8 minutes. A peak at 4 minutes retention was suggested to be sarin from the peaks of its　fragmented ions in EI-GC/MS (electrical ionization mode) spectrum, from which we could detect demethylated substance of sarin at m/z 125 and methyl-fluoro-phosphonate dihalide at m/z 99, we could not detect the ion of sarin itself which must be at m/z 140. From CI-GC/MS (chemical ionization mode) we could detect　molecular-related ion (M+1) of sarin at m/z 141. Using 31P−NMR　spectrum to detect phosphorus atom signals we received a spectrum as shown in Figure 2. 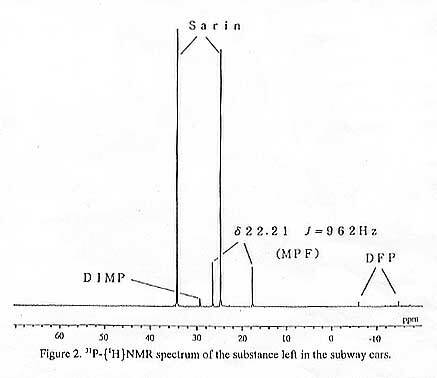 Figure 2, 31P-｛1H｝NMR spectrum of the substance left in the subway cars. Signals at -10.42 ppm and 29.32 ppm were　identified　from their standard materials as DFP and DIMP respectively. A signal at　29.62 ppm (d, J=1037 Hz) was within the range of the chemical shift of sarin , the　signal was at 28.95 ppm (d, JPF=1036 Hz) ; we concluded that this signal was　from the phosphorus atom of sarin. These substances identified by NMR studies were　comparable with those identified by the GC/MS analyses. Unfortunately we could not　identify the substance from which we received the phosphorus signal at 22.21 ppm (d,J=96.2 Hz). Sodium ethoxide was added to　the material left in the subway cars and mixed. The water soluble portion and ether　soluble portion were separated and both portions were treated to induce tenbutyldimethylsiryl (TBDMS) derivatives and analyzed using EI-GC/MS. We could not detect the peak of sarin but could detect the peak of methyl-ethyl-phosphonate isopropyl ester in the mass spectrum analysis of ether soluble portion. In　the spectrum of the water soluble portion we detected TBDMS derivatives of methylphosphonate monoethyl ester, methyiphosphonate (MPA), and isopropyl-methyl-phosphonate (IMPA). The reactions which occurred between the materials and sodium ethoxide can be explained by the mechanism shown in Figure 3. 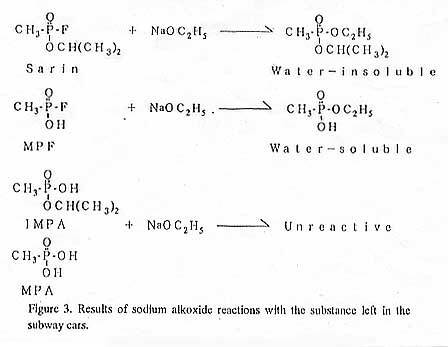 Figure 3, Results of sodium alkoxide reactions with the substance left in the subway cars. So called Williamson's synthesis　shows that sodium ethoxide reacts with halogens but not with hydroxy residue . Accordingly, sarin was converted to methyl-ethyl-phosphonate isopropyl ester, but　MPA and IMPA were not affected and remained intact. The important aspect of this reaction was that methylphosphonate monoethyl ester was produced, which means that a content of the material in the bags was methylphosphonate-fluoride (MPF). Considering this result and the structure of MPF,　the signal in the 31P-NMR spectrum which we could not identify must have been from　MPF. The existence of sarin in the　materials left on the subway cars was proved using GC/MS analyses, 31P-NMR　studies and other methods. 31P-NMR spectra were measured in 1H decoupling mode. Sarin and its related　chemicals do not have hydrogen atom bound to phosphorous atom directly, and　furthermore, the phosphorous atoms were coordinated by four atoms other than　hydrogen. This means by stereochemistry that there are no influential hydrogen atoms near the phosphorus atoms. These facts suggests that there is little change in 31P-NMR　signals by nuclear Overhauser effect (NOE). Using trimethylphosphonate as an internal standard for the phosphorous contents of the liquid left in the subway car, we analyzed it with 31P-NMR. Combining these　results and the results obtained from the 1H-NMR spectrum, and gas chromatography,　the concentrations (w/w) of phosphorous compounds sarin, MPF, DIMP, and DFP　were found to be 35％, 10％, 1％, and 0.1％(trace amount) respectively, and those of　hexane and DEA, which were used as solvents, or a reaction promoter, were 16％　and 37％ respectively.